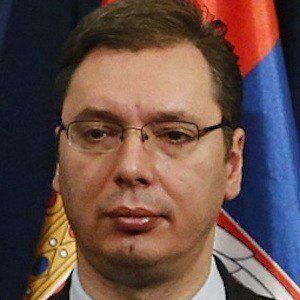 Serbian politician who became First Deputy Prime Minister of Serbia in 2012. Prior to holding that post, he served as Minister of Information and Minister of Defense. He joined the Serbian Radical Party at the age of twenty three and became Secretary General of the party at twenty four. As Minister of Information, he instituted fines for journalists that criticized the government and closed off access to foreign television. In 2014, he publicly stated that he regretted these actions. He married Tamara Vučić in 2013. He had two children from a previous marriage with Ksenija Vučić, whom he was married to from 1997 until 2011. The Serbian pop singer and journalist wrote a column criticizing Ivica Dacic, the Prime Minister under whom he was appointed Deputy.